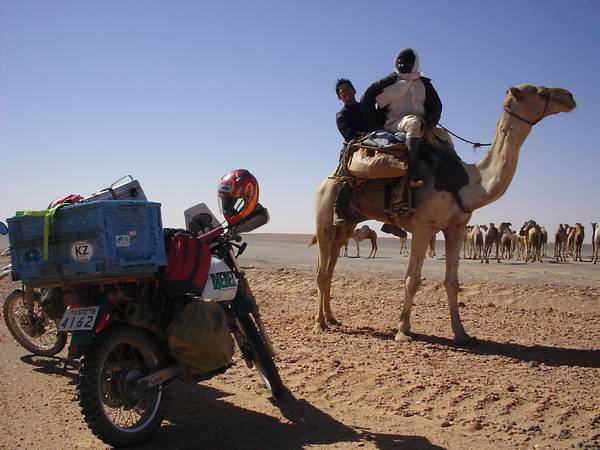 The motorcycle travel from Japan to South Africa on my DJEBEL200. My travel route was shown on this under map. This world map is presented by website "Shiroi chizu koubou". I am riding my motorcycle "SUZUKI DJEBEL200 (DR200-SEII)", it I had already run 100,000km in Japan. And so I tried the next step "Traveling around the world on my moto". In the end, I travelled half the world, about 43,000 km. I passed through Russia, Central Asia (includind China), Middle East, East & South Africa. I met many nice people, saw a lot of beautiful nature, understood the real condition of the world and had important experiences in this time of travel. So I am satisfied with my travels and never regret deciding to finish it. If anything, I have gained new motivation to go to the next step. Thank you very much, everyone I met before starting and after finishing my travels! The one of my memorial photos in Nubian Desert, Sudan, Africa. If you would like to use my texts or pictures on this website, please contact me "200＠bashishi.com"(please change ＠ to @ when you use my adress) before you use them. My 1st counter was stopped over 20,000 accesses on Oct, 2004. This 4th one started since Feb 16, 2010. This website was started on April 1, 2004.